I mean, is it? I know that for me, starting a blog was merely a means to an end. I had loads of travel photos and stories to show friends and family. Crafts were being done, and friends wanted to know exactly how replicate them. Food was prepared and folks wanted the recipe. It sounds a bit selfish, but I just didn't want to write a million emails to everyone. So now, someone will inquire and I simply say, "It's on the blog"! Disclaimer- I am many things, a writer I am not. I can paint anything you want. I will sketch your child's face like no other. I will decorate the tar out of a space, and I can just about sew and crochet anything your heart desires. OH! And I can cook like the dickens, but I am no writer. If you are an English major, I am terribly sorry. And if you are still reading in spite of the horrid grammar, I salute you! You are awesome and I love that you are hanging in there! So for me, I just write as if you are sitting in front of me and we are chatting away. Which probably is the culprit of the horrible grammar. Getting back on course, I know there are bloggers out there who write so beautifully. I am in awe of them. And I'm sure that their blogs are works of art. Blogging/writing is their craft. They probably have written many things and are published. So, for them, a blog post isn't just slapping down words in a hurry, it's skillfully crafted and molded and it shows! But for the average blogger, how much time do you actually spend on a post? Not an important, life changing post, but just the average, mid-week post? I can honestly tell you, I spend about 30 minutes. And that INCLUDES editing photos with watermarks! One thing I told myself when I started this blog, is that I would always be authentic. I never claimed to be a writer, but I still didn't want to be so horrible at it that it embarrassed my family, (which they don't even really read my blog). So I didn't want to change all words and abuse the thesaurus. I wanted my readers to read it exactly how I would talk to them if we were face to face, incorrect grammar and all! My question remains, is blogging a craft in this world chalk full of technology? What would dear Jane Austen think of blogging? I am not one of those bloggers who write beautifully. I wish I was able to though. And I would kind of agree with you. I think that it is a craft. I think the beauty of blogging is that there are so hard and fast rules and that you can make it whatever you want. Yes, some blogs may have beautiful writing or amazing design and stunning photos, but each person's definition of a "successful" blog is different. There may be a craft to blogging, but that also is probably different for everyone. I love that a blog is a great way to share your opinions and ideas to the world, and people can take it or leave it. That's a very interesting question! I come to blogging from a writing background, and so as a blogging I'm one who focuses much more on the craft of writing and editing my blog posts, not the artistic/photography/creating actual things side of blogging. Blogs vary so much depending on the author! 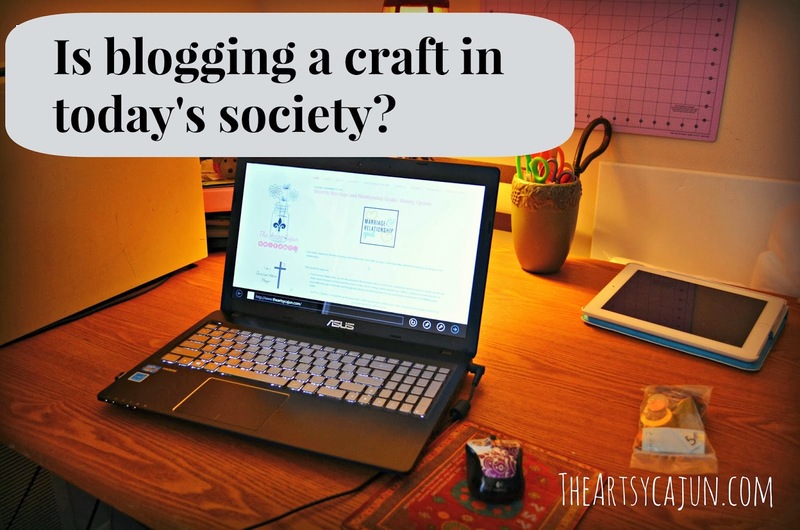 I definitely think there is a craft to blogging! I love reading the blogs of those who write beautifully but I also enjoy those who post their crafts and artwork because I feel like those show a side of people we wouldn't see otherwise as well. I'm definitely no English major either but I think it's still fun that we have these spaces to share our lives. Girl, I really really wish I spent half an hour on a blog post!! Somehow it just doesn't come that easily to me....maybe that's why I think that blogging is a craft but I also agree with my fellow commentors (is that a word??) that it really depends on who the blogger is. PS--I love your blog even though you're not an English major!